Let’s just begin with “I can’t believe what has just happened.” I have just been hired by an airline to fly a jet aircraft. I have a new life, a new wife and a brand new baby son. What part of cloud nine should I be requesting. Euphoria has taken hold and to be standing on the training grounds of an actual airline was way beyond description, or my expectation in this period of my life, I had just turned twenty-eight years old. I began training on January 6th of 1969 at ONA’s Training Center, located at New York’s John F. Kennedy Airport. We as a class of twelve pilots, from all walks of the aviation industry, will be subjected to an orientation period, followed by aircraft systems training, and in an adjoining classroom sat a mockup of the DC-9 cockpit. It was called a Cockpit Procedures Trainer. A period of time would be spent in it dedicated to learning where all of the switches and controls were located in the real thing. We will then be expected to go from this trainer, directly to flight training in the real aircraft, skipping past the flight simulator. Company orientation involved learning of the company’s history and also meeting some of its key personnel. We also received our airline ID cards, which established our seniority number in accordance with our birthdays. I was one of the younger hired so would be placed near the bottom of the seniority list. ALPA, the Airline Pilots Association, represented our pilot group at ONA. A pilot union was something new to me and we were to be on probation for one year which allowed the company to pay us a minimum wage of $700 dollars a month. They would also pay us a per-diem when away from our domiciles. That would be determined if we finished training. During our orientation we were introduced to the Chief Pilot of the New York domicile for the DC-9 operation. As a group we were taken to his office, he had all appearances of being a very busy man, and I recall being prompted to ask him what time it was. He responded by unzipping his fly and pulling out his pocket watch. I thought this was one hilarious move on his part and it turns out, even though very serious, he was an entertaining pilot to fly with. I never knew anyone that disliked Ed. Of the dozen of us beginning training, three were retired military, two were former airline pilots who were rated and had previously flown the DC-9. Six had worked for commuter airlines and then there was me. I was the sole general aviation, corporate pilot candidate, without an ounce of turbine experience, how was I to fare. Only nine of the twelve survived the training to become line pilots which, thankfully, included me. And, it wasn’t an easy transition. Thanks go to my flight instructor, known as Moose Adams; who coached me through and taught me how to fly a jet. I will be forever indebted to this kind and gentle man. After training our group went three different directions, a few stayed in New York and the rest of us were divided between Oklahoma City and Dayton Ohio. We would be flying freighters in support of the US Air Force at Tinker AFB, located in Oklahoma, and Wright-Patterson Field at Dayton. ONA had signed a military contract to fly Logair, a scheduled military cargo network that covered all of their bases in the country. I was fortunate to get assigned to Tinker AFB, near Oklahoma City, which wasn’t all that far from Little Rock, where my wife and infant son had stayed with her parents while I finished training. ONA operated both its Electras and DC-9 aircraft on the military freight routes. Where were you when? : I baked my first cake when our son Ronnie celebrated his first Birthday living in a Delwood City apartment; where just a month earlier we’d witnessed Neil Armstrong do his moonwalk after landing the lunar module Eagle on its surface. Delwood City is also when our son began walking on earth. Some events you never forget. Our stay in Oklahoma didn’t last long. Our airline had picked up another military contract for the DC-9 aircraft. This time it was for the Navy’s Quicktrans cargo operation. Much the same as the Air Forces Logair network, this was the Navy version. We would transfer to Navy Alameda, located in the San Francisco Bay Area, our newest crew domicile. So we packed up and headed west… it was “California or Bust,” we had ten days to get there and settle in. We would remain in California for the remainder of my career with ONA, which would be another seven years. There were approximately 17 aircraft, both DC-9 and Lockheed Electras, devoted to cargo operations covering the commercial and military markets. Auto Air, at Detroit’s Willow Run Airport, was a freight forwarder for the auto industry shipping massive amounts of car parts overnight to various factories around the country. It was a lucrative contract but you never knew where your next destination might be, as the shipping was responsive to the auto industry’s daily needs. Most of this flying was done at night and when showing up at the airport you had no idea where you might end up the next morning. As a supplemental airline, often referred to as a non-sked, the majority of revenue for the airline came from its international passenger service. ITC’s (Inclusive Tour Charters) provided the bulk of flying for the airline. With a fleet of Douglas DC-8s the airline flew group charters to destinations all over Europe. With its increase in business more aircraft were added to the fleet, including new DC-10’s. This in turn necessitated an increase in pilot hiring, which would make me a Captain prospect in just a few years’ time. Therefore at the ripe old age of thirty years I became an Electra captain. Life was good. Now securely settled on the west coast I began commuting to my new crew domicile at Dayton, Ohio and the Wright-Patterson Air Force Base. From there I would fly the Logair routes and on occasion fly out of Willow Run on the Auto Air contract. One of my favorite destinations was from Detroit to Mexico City. That trip required a fuel stop at Houston before heading south of the border. 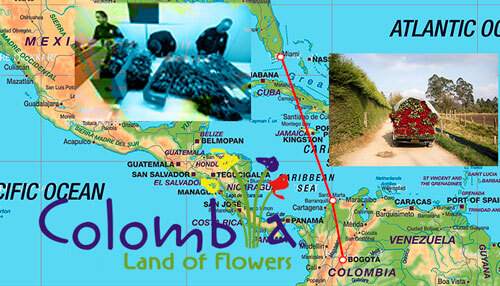 One subsequent trip on a commercial contract involved a trip from Miami to Bogota, Colombia, carrying Motorola TV cabinets. We were live freight going down and were scheduled to ferry back to Miami empty. The long trip, made longer because of an inoperative pressurization system, would also require a fuel stop at Barranquilla on the gulf coast. After a long night navigating through the mountains using non-directional beacons, instead of VOR because of our low altitude, we arrived safely at Bogota the next morning; elevation 8,360 feet above sea level. After a well-earned sleep and an evening in the city, we happily made our way out to the airport the next morning for our return flight back to Miami. We noted we were happy to be in more familiar territory back at the Bogotá airport, especially after passing a myriad of military tanks parked in the streets that were manned by machine-gun toting soldiers. While fueling and preparing a flight plan to be filed, I was approached by a gentleman in uniform, also with a machine gun, who posed an interesting question. In broken English he says, “Captain, you take flowers Miami yes?” Of course I had no authority to approve such a request. My reply would be the obvious… “I’m sorry, but no, we can’t do that.” The man looks me in the eye and repeats, “Captain, you take flowers Miami yes?” Again I repeat, “I’m sorry, no.” The gentleman, with his gun, then turned and walked away. So now we are ready to depart and we climb into our seats while the flight engineer pulls up the ladder and closes the big cargo door. We then call for a start cart. Because we don’t have an APU (an Auxiliary Power Unit) we will need the start cart to provide a pneumatic source of air to rotate the turbine engines. We have four of them, but we only need to start one and can then provide the air ourselves to start the others; a simple, normal, turbine operation. After several minutes, say about fifteen, we have not seen a cart heading our way and we call again for the air cart. Finally, we get a reply, “Sorry, no cart for you today.” Naturally we ask why no cart today? An instant reply comes back to us in the form of, “You take flowers Miami yes?” Well, they for sure have us now; the handwriting is on the wall, we are going to take flowers to Miami, Yes. What I wasn’t sure of was what else might be in with the fresh-cut flowers. It was well known there were many drug smuggling operations from South America and especially out of regions in Colombia. We had no way of knowing, until U.S. Customs gave us the once over when we arrived back in Miami, what sort of trouble we might be in. After a couple of hours of loading boxes of flowers an air start cart mysteriously appeared beside our aircraft so we cranked and were on our way. Our bill of lading showed “Cut Flowers” and thankfully, according to the inspection team in Miami, that is all they found. But, on second thought, it could easily have been an inside job. In the ever growing trade and even today, it’s going on somewhere.